Glenn Murray has eight goals for the season and could easily be about to make it nine. "But if you’re going to side with Brighton, it’s worth going for a bigger price than the 7/4 on the straight win. 66% of Burnley’s home matches have gone under 2.5 goals this season and six of the last seven games between these two have had less than three goals so Brighton to win and under 2.5 goals in the game at 4/1 makes plenty of appeal." It's not so easy to work out what's gone wrong with Burnley this season. Same manager, same players to a greater or lesser extent, same gameplan. Then again, maybe that's precisely the problem. It's one thing rocking up in the Premier League and other teams not knowing what to expect from you but after a couple of years of doing the same thing, the opposition starts to work you out. Like a lot of other teams in a similar position in the table, a huge problem is the absence of a proven goalscorer. Last season Chris Wood scored 10 goals despite playing roughly half of the maximum amount of minutes possible but we've now played a third of the season and the team's top scorer Sam Vokes has just three, with a further three players on two goals. Prolific goalscorers aren't easy to come by but in January the Burnley powers-that-be really need to make a signing up top. If they don't, then relegation could be looming. I'm not sure Chris Hughton gets the credit he deserves. His squad is a real motley crew of players, none of whom were particularly expensive. But he makes it work by putting in place a great team spirit, simple tactics that the players are comfortable with and having strong man-management skills. It's very seldom you hear complaints from a Brighton player about team tactics or lack of playing time. Jose Mourinho could learn a thing or two from Hughton about how you don't need mind games, cryptic comments in press conferences and public criticism of players to run a successful football club. After a good win over Palace, they're now into tenth. They will however have to make do without Shane Duffy, who was sent off in that midweek match. Remarkably, the last five matches between these two have all been draws. And not necessarily of the entertaining kind, with three 0-0s, plus a 1-1 and a 2-2 back in The Championship in the 2015/16 season. The market is finding it pretty hard to spit the two with Burnley 15/8, Brighton 7/4 and the draw 2/1. It's virtually impossible to make a case for the hosts. Their last seven league matches have yielded just two points and their home form is poor. No huge disgrace in losing to Chelsea (albeit 4-0 was a proper hammering) but they would have expected to have beaten Huddersfield (1-1) and worse was to come when they lost 2-1 at home to Newcastle a fortnight ago. Brighton have won twice away this season but considering those victories were against Huddersfield and Newcastle, you can see that when they do win on enemy soil, it (unsurprisingly) tends to be against relegation-candidates. Which of course is what Burnley are. But if you're going to side with Brighton, it's worth going for a bigger price than the 7/4 on the straight win. 66% of Burnley's home matches have gone under 2.5 goals this season and six of the last seven games between these two have had less than three goals so Brighton to win and under 2.5 goals in the game at 4/1 makes plenty of appeal. We've already discussed how Burnley aren't exactly blessed when it comes to goalscorers so it will come as no surprise that none of their players are worth a second look on the 'to score' market. What about Brighton? Well, the big difference between them and Burnley could well be that man Glenn Murray. A proper old-fashioned physical centre forward, his eight goals this season are almost half of Brighton's total goals. What Burnley wouldn't give to have someone like him in their ranks. He's scored in seven different matches this season from 15 starts which is just under one in every two games. Given he's 13/8 to score against one of the weakest sides in the division, that can certainly be classed as a value bet. Florin Andone had to wait till the 11th match of the season to finally get a game but he's making up for lost time with a goal in each of his last two matches. He's 15/8 but we'd have to see more from him to justify backing him at those odds. Lewis Dunk is 10/1. Not a bad price for a man with two goals this season already. Same-game multis allow you to combine two or more selections from the same match in one bet. 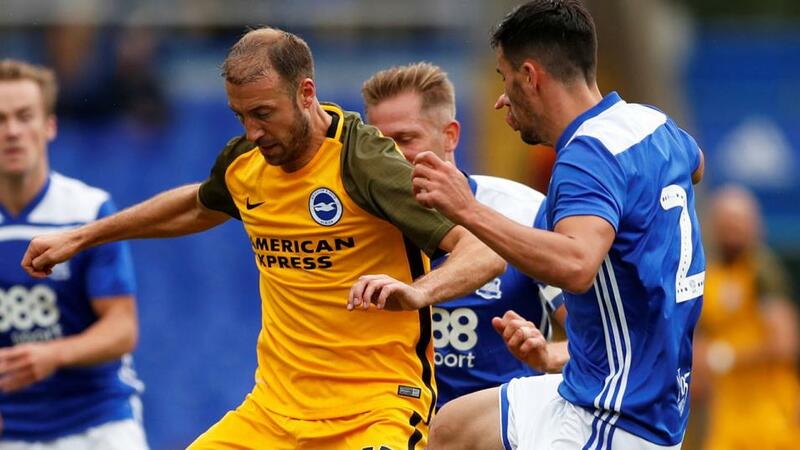 Backing Glenn Murray to score first with Brighton on the double chance market (win or draw) comes to odds of 6.48 and isn't the worst bet you'll see all weekend.